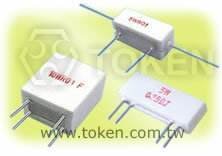 Token's Kelvin style (LSQ) family current sensing 4-terminal resistors handle high-wattage applications. Providing ultralow resistance values (to 0.01 ohm) for relatively high current requirements, new four-terminal cement filling resistor from Token combine the advantages of a Kelvin configuration with PC board mounting capability. The Kelvin (or 4-terminal) configuration enables current to be applied through two opposite terminals and a sensing voltage to be measured across the other two terminals, eliminating the resistance and temperature coefficient of the terminals for a more accurate current measurement. 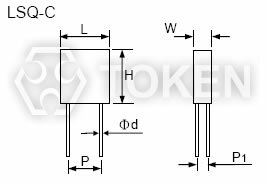 The 4 lead resistors are a new version of Token's (LSQ) Precision Current Sensing Family Resistors which was specially designed for use in a Kelvin method where a current is applied through two opposing leads and sensing voltage is measured across the other two leads. 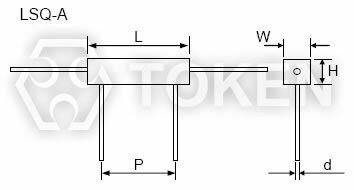 Token LSQ series is specifically designed for low resistance applications requiring the highest accuracy and temperature stability. The advantages of Kelvin connection enable the resistance and temperature coefficient of the leads to be effectively eliminated. The need to connect to the leads at precise test points is eliminated, allowing for tighter tolerance on the end application. 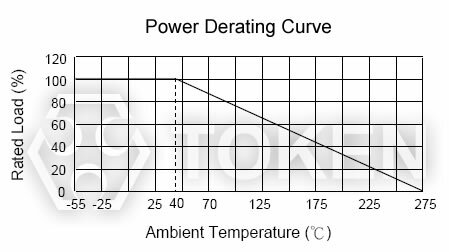 Also results in a lower temperature coefficient of resistance and lower self-heating drift which may be experienced on two-terminal resistor. 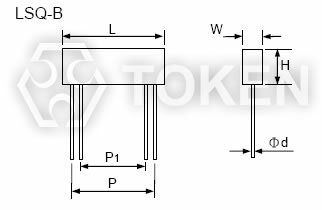 Token will also produce low ohmic resistor LSQ series outside these specifications to meet customer requirements. Contact us with your specific needs. 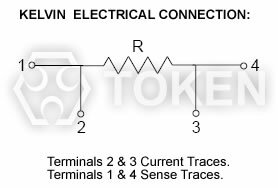 Download PDF Specification Current Sensing Four Terminal Resistors (LSQ). Superior anti-surge capability & Low TCR. 4 leads for Kelvin connection with extremely low resistance values. Special inorganic potting construction provides high moisture resistance and thermal conductivity. Automatic Test Equipment, Current Sensing Application. High Precision Instrumentation, Industrial, Medical and Military, Measurement Instrumentation. Withstand Voltage 1000V, 1 Min. No damage on the appearance.